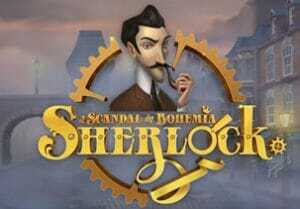 Based on the first of Arthur Conan Doyle’s stories to feature the famous consulting detective, Sherlock: A Scandal in Bohemia is a 5 reel, 25 payline slot game from Tom Horn Gaming. Boasting superb Victorian-style design, it comes with 2 pick me bonuses and a free spins round. Play on all devices from between 10p and £100 per spin. The visuals in Sherlock: A Scandal in Bohemia are terrifically well done. A 19th century London street scene forms the backdrop to the reels. There you’ll find A to 9 royal values, a purse full of coins and a notebook. The best paying symbol is the mirror featuring the kissing couple. Land 3, 4 or 5 of these for a payout of 10, 15 or 525 times your stake. Helping Holmes on his quest is Irene Adler who is the game’s wild. She can appear on all 5 reels and substitutes for all symbols apart from the scatter and bonuses. This detective story comes with plenty of extras too. The Newspaper Bonus Game feature - this is triggered by landing 3, 4 or 5 of the bonus symbol (Sherlock smoking a pipe). You’ll then be taken to a new screen and shown a newspaper made up of 6 photos. Pick a snap to win a cash prize. The round continues until there’s a pick where no compromising photo is revealed. 3, 4 or 5 bonus symbols will give you up to 25, 55 and 75 times your stake respectively. Free Spins Bonus feature - land 3, 4 or 5 of the padlock scatter and you’ll receive 10, 15 or 20 free spins. Tom Horn Gaming has created an enjoyable all-rounder here. The mechanical style reels are well constructed and the soundtrack fits the Victorian era theme rather nicely. There’s a decent variety of extras on offer here too. Medium variance, you can win 25 times your stake if you fill the reels with the highest value symbol. If you’re a fan of Arthur Conan Doyle’s most famous literary creation, then Sherlock: A Scandal in Bohemia is well worth investigating. I also suggest you try Tom Horn Gaming’s Frozen Queen which offers payouts up to 1,152 times your stake on each free spin.